Americans' appetite for adventurous, adrenaline-inducing activities are keeping recreational business entrepreneurs busy as they try to keep up with sporting trends. Fueled by competitions like the long-running The Amazing Race, American Ninja Warrior and the X Games, serious athletes and weekend amateurs are seeking exhilarating challenges that test their physical skills and in some cases raise the fear factor. 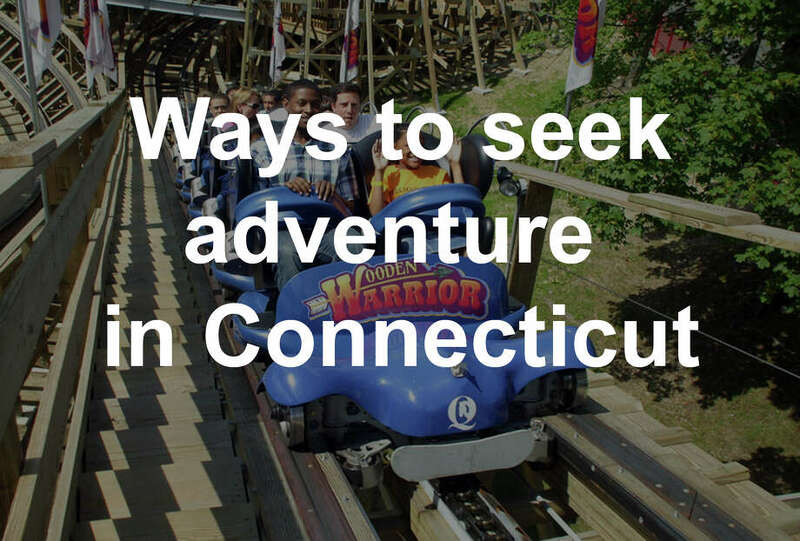 Click through the slideshow above to see ways you can get adventurous in Connecticut. The latest craze is zip lining. Aerial trails are springing up around the country at a rapid rate. There are about 150 nationwide. In Connecticut there are at least six facilities from an indoor course in a New Haven retail furniture store to the 11 color-coded courses at the Adventure Park at the Discovery Museum in Bridgeport. "We're all about nature and thrills and a sense of achievement," said Anthony Wellman, director of marketing and communications for the Adventure Park, which operates a second Connecticut facility in Storrs. The Bridgeport courses range in difficulty from the introductory challenge with limited physical exertion suitable for children 5 years old, up to the double black diamond for advanced climbers. Wellman said Bridgeport's is the largest aerial forest park in Connecticut. Dan Jaskot, president and general manager of Empower Leadership Sports & Adventure Center in Middletown, said this relatively new sport has really taken off. "It's extremely fun. It's going into the unknown. It's the spirit of exploring the unknown that appeals to people. You're in the treetops," he said. Jaskot said you don't need to be an experienced climber to try zip lining there. For some people it's more of a mental than a physical challenge. Some people do it for the fun and the adventure. Others do it for the chance to overcome fears and obstacles, said Jaskot, who uses the course for leadership training for corporations, senior centers, parks and recreation camps, universities and individuals. "For some people it could be a life-changing experience," he said. Empower's facility has a half-mile guided course broken up into five zip line rides; the shortest is 200 feet and the longest is 650 feet. The climb starts 10 feet off the ground and continues to a height of 75 feet. At Jordan's Furniture in New Haven there are four 200-feet long zip lines that are 48-feet high. Patrons can zip over the 1,000-nozzle water show with state of the art lights, sound and music, choreographed to 45-feet high water. And that's only a fraction of the store's IT Adventure Ropes Course experience. "Jordan's incorporates entertainment within the retail stores because it makes them a destination. Customers travel for many miles to not only shop in a spacious showroom for beautiful furniture but also so that their families can have a fun shopping experience," said Heather Copelas, public relations/marketing communications manager for Jordan's. There are zip lining parks throughout New England. In Charlemont, Mass., Zoar Outdoor offers a three-hour canopy tour experience in the northern Berkshires with 11 zip lines, two sky bridges and three rappels. "There's a lot of variety. You start at the top of a high wooden ridge off the floor of the Deerfield River and zip along the ridge. At the end you zip down the face of the mountain. The highest point is about 80 feet off the ground," said Bruce Lessels, president of Zoar Outdoor. It's a progressive course that starts off slow and goes faster as participants continue. A second Massachusetts facility, Berkshire East Mountain Resort, has three different zip line canopy tours featuring some of North America's longest zip lines at least one of which has people soaring 200 feet off the ground. According to its website "Berkshire East Canopy Tours is New England's largest zip line destination" and was featured by USA Today as one of the top 10 zip lines of the United States. "Whether you are getting a taste of zipping on our Base Area Tour or seeking an adrenaline rush on our Valley Jump, there is something to suit all interests," according to the website.